My discussion of Web Add-ins will center on Word, since that’s “where I live”. The information on the basics is certainly relevant to other Office applications (Excel and PowerPoint) if the Web Add-in is hosted in a Task Pane – the only kind of Web Add-in Word supports. Why HTML and CSS? Because the task pane hosting the Web Add-in contains a web browser control. The user interface for the Add-in is an HTML web page: all the information, controls for user interaction and the code for managing it all, plus working with the Office application is “packaged” in the HTML. There’s a good example on MSDN to give you a taste of what’s involved. You don’t need anything more than Windows 7 (or later), a text editor and Word 2013 (or later) installed on your machine. 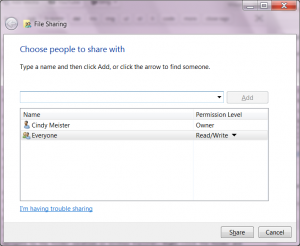 Navigate to the folder location in Windows Explorer. 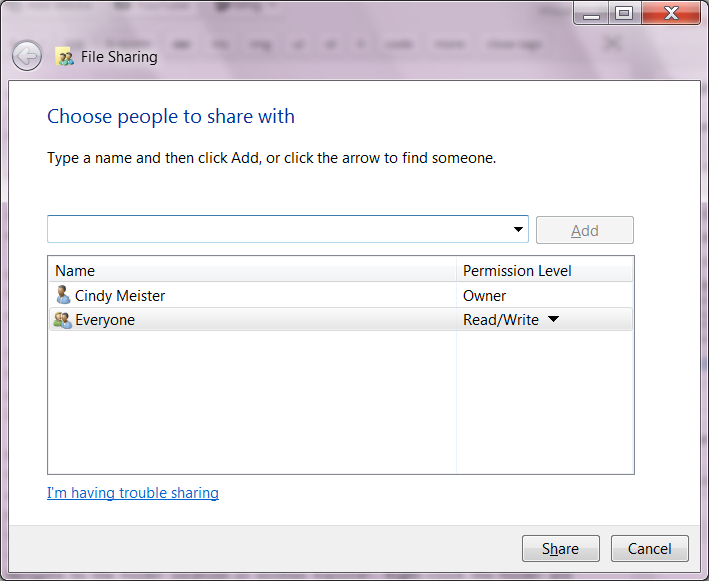 Right-click the folder and choose the command Share with/Specific people. If Everyone isn’t listed, display the dropdown list and select it, then click Add. Everyone should have Read/Write permissions. If it doesn’t, click on the dropdown arrow and select that entry. Confirm by clicking the Share button. After a short while the message “Your folder is shared” should appear. Click on the copy link to get the required path for Step 6 in the instructions on MSDN. Click Done and proceed with the instructions. This entry was posted on Tuesday, July 28th, 2015 at 21:03 and is filed under Web Add-ins. You can follow any responses to this entry through the RSS 2.0 feed. You can skip to the end and leave a response. Pinging is currently not allowed. Would you know if something like a ‘this can be done now’, ‘this can be done in the near future’ overview exists, allowing people to take decisions like ‘Will we do this now in VSTO or wait a few months and make use of the web add-in model’? Good question :-) If you need to create new documents or save documents to specific locations then you need to stick with VSTO (or the Open XML SDK if you don’t need to interact with the user inside the Word application) for now. I’ve heard rumors that, eventually, something like this might become possible using REST technology (as in, technically it should work). But no idea when that could become current (if ever).